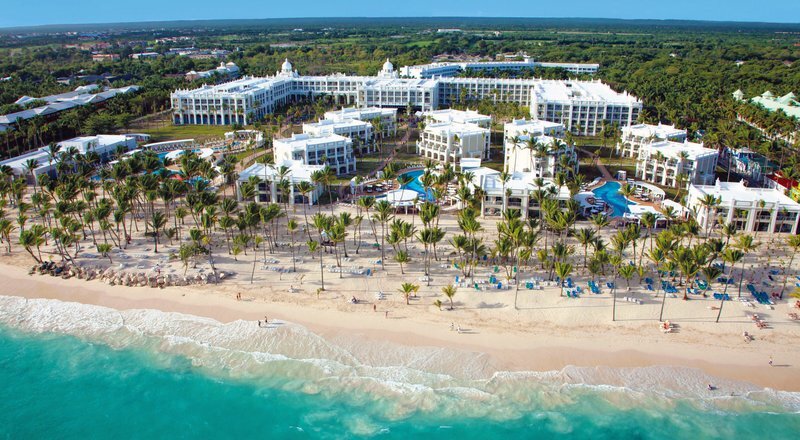 The Hotel Riu Palace Bavaro is the newest RIU hotel in Punta Cana situated on a beautiful beach in Arena Gorda. The buildings are surrounded by amazing views of the ocean and lush gardens. It is the perfect place for families, couples or friends to enjoy the high quality of RIU service, the comfort you can expect of a Palace and relax in this beautiful beach location. Relax by enjoying the facilities that this resort has to offer its guests. It includes three fresh water swimming pools, a children’s pool. In a calming atmosphere you can enjoy the Renova Spa where you can pamper your body with beauty treatments and massages. Take advantage of the free sauna, two Jacuzzis and gym. You will have fun all day long with the entertainers of the entertainment program or doing the various activities or sports by yourself. At the resort you will have the opportunity to play on the four tennis courts, table tennis, volleyball in the pool or sand, windsurfing, sailing, kayaking, snorkeling, bodyboarding one introductory scuba lesson in the pool. Near the hotel, golf lovers will find a beautiful course. Your kids between the ages of 4-12 will enjoying the RIU Land kids program where they will make new friends and be able to enjoy the endless sports and activities together with the entertainment team. At night there are shows and live music, the casino is open as well as the “Pach Youra” club where you can dance to your favorite tunes. Dining options are plentiful including 24 hour room service and 5 restaurants, the main buffet with cooking stations and the “Krystal” Fusion restaurant, “Geisha” Japanese restaurant, Grill and steakhouse, “La Bámbola” Italian restaurant (buffet starters). 5 bars including a swim-up bar and sports bar will have all your favorite drinks. The 610 junior suites all have a hydro massage bathtub, living room area with sofa, fully stocked mini-bar, and liquor dispenser, safe free Wi-Fi and a balcony or terrace.